After a couple of years of delays and procrastination, the rebuild is in the final stages! The engine is running with my original carburetors and some fine tuning, I’ve learned a lot about the importance of the Pilot jet and how to tune CV carburetors in the strip and rebuild process that has occurred. My suspicions that the cam timing was out was correct, I stripped the top end down and the cams have shifted 2 teeth while I was doing the shims hence all the issues. I have re-aligned the cams, and the engine has fired up first go 🙂 I managed to take it around the block (a few times) and its a joy to ride. Just waiting on the paint work to get finished. In terms of completing small items, I ordered a new tinted screen and I will be taking off the electrical brackets I made and getting them powder coated next week. 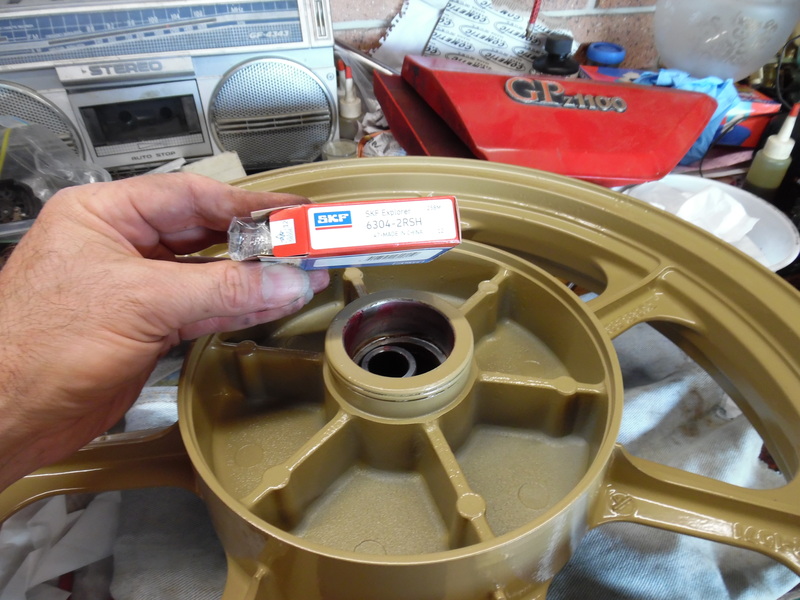 Need tyre fitted to the new rim and put this rim on the other GPz1100. Completed body work, just needs badges fitted. 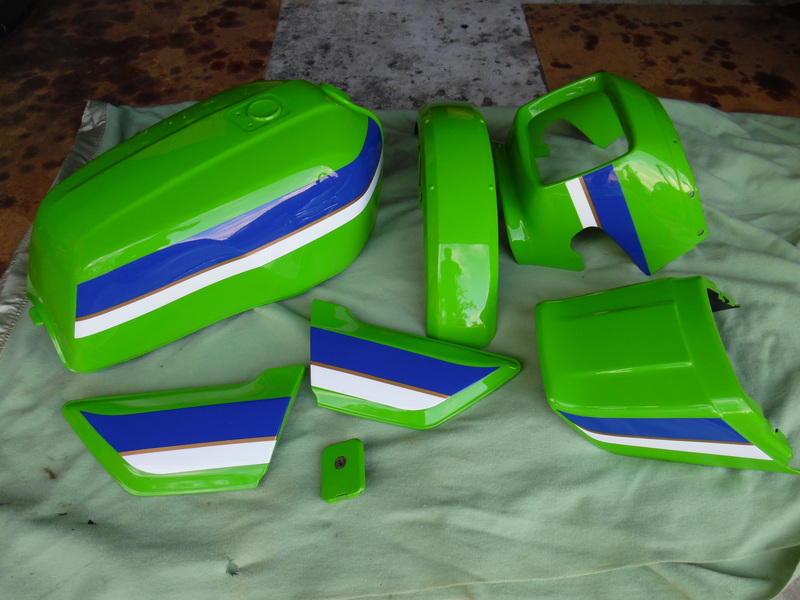 The base paintwork is done, I went to the shop to have a look and its very nice, they just need to determine the best way to finish the stripes, either Decals, Paint or a mix of both. Should be ready first week in October. Engine has stopped working after re-doing the shims, it wont fire so I am pulling the cam cover off again and rechecking the valve timing. I even borrowed a set of carbs to verify if it was my old BS34 CV carbs but I am now suspecting the timing is out, god knows how many times I checked it! 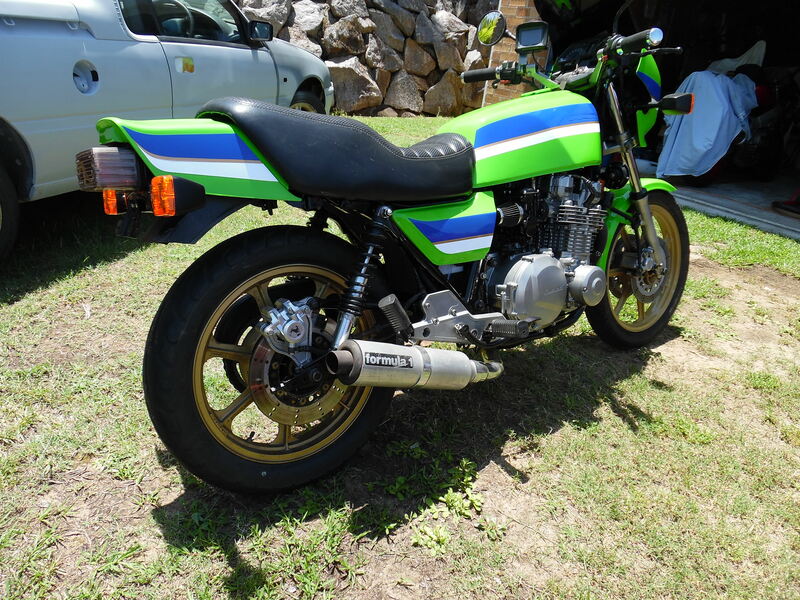 The bike is coming together very well, still need to get a new rear tyre on the new rim. I’ve rolled the GPz1100 out and I’m determined to complete it over the next few weeks. Over Christmas 2017 I reassembled the head which meant lapping the valves back in, checked and shimmed the cams and its now ready to install. This week I honed the cylinders and fitted rings, then dropped the head on. I had previously purchased a 76mm Cometic Head Gasket for it so it went in. Only trap for the unwary is to make sure the cam chain guide is fitted in with the rubber damper and alloy piece before putting the barrels on. At this point I decided I would fit new copper washers to the head bolts before I put the engine in the frame. I also need to chase up a cam cover bolt as one snapped when undoing the head some time back. Since I don’t have these parts, I started on the wiring harness which is all mounted. First I hooked up a battery charger and began testing the power and ignition circuits. I need to to fabricate some connectors as the originals are damaged. I also started on the blinkers, one needs replacing and a rear blinker wire is no good, so it needs repair. I also need to mount the regulator/rectifier somewhere and make a nice bracket for it. When I removed the engine, the Oil,Neutral wires were damaged so I need to fix those. Just trying to source some coloured wire that matches pretty close and put some quality male bullet connectors onto them and cover them in plastic tubing. Feb 3rd – Engine assembled, 90% of the wiring harness is fixed and I just need a few parts from the US to complete things. I will look at lowering the frame over the engine and then bolting it all together. More progress next weekend. While the engine is installed I still need to get some cam half mood rubbers for it and on inspection I decided the intake rubbers should be replaced, so these are in transit to me. I also ordered a few body parts like front Blinkers. I purchased a Cometic head gasket since its fitted with bigger pistons than standard. These gasket are made from CFM-20. CFM-20 is a perforated steel core with an elastomer surface that is ideal for head gaskets. Allowing the head to be drawn evenly across the gasket surface while providing maximum sealing characteristics when exposed to coolants and oils. 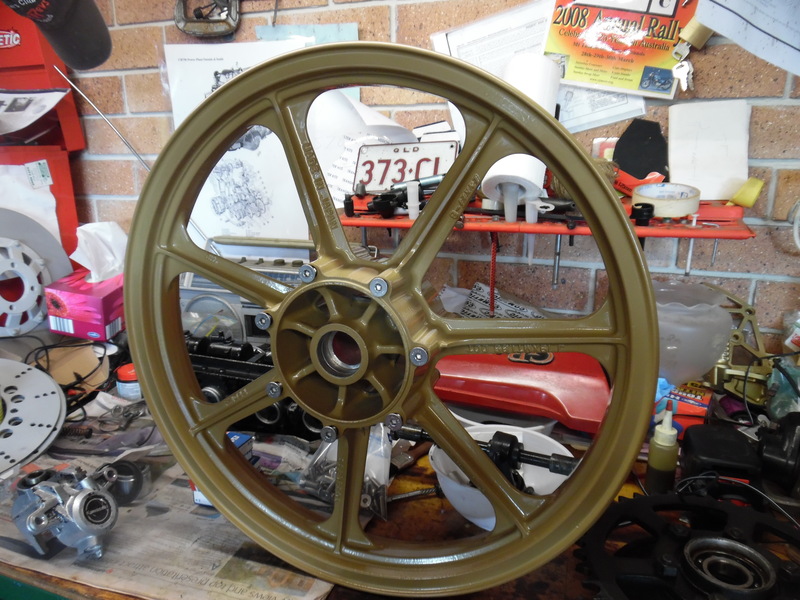 Not being happy with the original paint job on the wheels, I decided to get them powder coated, after some thought a gold colour would still look OK, so I stripped them down and sent them off to get powder coated. While they were away, I collected some new bearings and chased up some new stainless brake disk mounting bolts. For reference, the rear hub takes 6304-2RSH bearings, the front is the same as any classic Kawasaki (I have it somewhere so I will update here). Add Oil and start engine. excellent stuff mate, I’ve a B2 which is pretty horrible atm, I’ve had it a while and been collecting parts, I’m thinking about just getting it on the road rather than restoring it and then tackling it peice by peice when I have time , which probably means never ! ) really I’m just dying to use it but you site is an inspiration. I take it when you pulled the engine apart all was good, no need to do any bearings or check the crank ? The bearings are needle rollers so they are pretty much indestructible as long as oil is fed to them and its reasonably clean. As for doing the resto of your bike, try this. Take 1 item and finish it.. if the frame is apart then start there and get the swingarm done at the same time (remove the bearings first). Then get the forks done, then the wheels.. just do one thing and bolt it to the bike.